Step 1: Take everything out of the refrigerator. Remove everything out of the refrigerator by throwing away all the expired food and old leftovers. The foods should be placed in a container with ice as you continue to clean the rest of the refrigerator. Throw away outdated canned foods, empty bottles, and jars. Step 2: Clean the drawers and shelves. Aside from the foods, the drawers and shelves should also be removed. Metal and plastic shelves should be washed with warm water and soap, while the glass and ceramic pieces should be washed with cold water to avoid breakage. You can also spray a household cleaner or sanitizer to obtain proper cleaning. Step 3: Wash the interior of the refrigerator. It is a good practice to wipe the spills in the refrigerator as soon as they happen. When cleaning spills, you should use a paper towel until it absorbs much of the spill then use a sponge with warm soapy water in order to remove the other remaining traces. To clean the inside of the refrigerator, make a cleaning solution of ¼ cup baking soda and 1 quart of water. Baking soda is a great sanitizer and odor remover. Once you applied it, you may not need to rinse it off unless it leaves a residue. Step 4: Organize the contents. Put all the foods back to the refrigerator by organizing them well into the drawers and shelves. Set a first in-first out rule for the leftovers. As much as possible, use transparent containers so you may not tend to forget wants inside the refrigerator. To maintain a good smelling refrigerator, an opened box of baking soda at the back shelf of the refrigerator can do the trick. Cleaning your refrigerator is a vital household chore that should be carried out well. This entails well planned steps in order to make your refrigerator look as good as new. Always bear in mind that keeping the expired and old leftovers will do no good, but will just take up much of the storage space. Also make it a habit to clean spills immediately to avoid its crystallization that makes them harder to remove. Proper care and cleaning of the interior as well as the drawers and shelves can make your refrigerator last longer. Post-party Clean-up – All about cleaning up the clutter. Putting Wallpaper Properly – Making everything attractive and organized. Maximizing Closet Space – Organizing and cleaning furniture and equipment. Choosing Sliding Door – How to take care of your home and your furniture. Green Flooring – Tips in making your lovely home beautiful and clean. Cleaning Equipment – Home cleaning tips and things necessary for cleaning. It is easier to clean the refrigerator when you are maintaining it every time you open it , get something from and put something in. It is really a good practice when you wipe the spills as soon as it happened, moisten a sponge with warm and soapy water and scrub it. Wipe all sides of the item just to be sure it is all clean and no more remaining thing to drip. Organized and clean the inside before making a weekly food shopping. Take out the things that are already expired and are not suitable to eat anymore. When you decide to have a deep cleaning, remove all items, make a solution of 1/4 cup baking soda to 1 quart warm water. Wipe the whole body of the refrigerator with this cleaning solution. It sanitizes, brightens and removes odor.You don’t need to rinse the baking soda off unless there is a residue. You may wipe it off with clean damp rag. Cleaning includes all walls, door and even rubber gasket. Remove also all drawers and shelves,wash it with hot soapy water.Rinse and drain it before putting it back. If your refrigerator is not a frost free appliance, make sure you defrost it every time you see a build up to about a quarter inch. Not only it saves electricity, but it also makes freezing more capable. How do I save time in cleaning my refrigerator? You can start by planning what you only need inside your refrigerator. Once you figured that out, you can take everything out and when you are finished cleaning, you will only put back things that you need inside. We always clean our refrigerator at night. So that everyone is going to bed and no one will interfere with your cleaning. It will be very difficult to clean it in the morning because everyone will get something in and out of the refrigerator. I see to it that I clean my refrigerator at least twice a month. I don’t like having a messy and smelly fridge, so I always check for spoiled left-overs, rotten fruits and veggies, etc. Baking soda is really a big thing when it comes to refrigerator-cleaning, it also deodorizes your fridge and helps in removing food stains. Avoid using bleach when cleaning your fridge. Bleach can be bad for the refrigerator’s surface and can also leave hazardous fumes that can be absorbed by food. Soap can be used but make sure to rinse it well. When keeping left-overs, always cover the container with the proper lid or seal it with cling wrap. This will minimize spillages and will prevent food drippings from staining your precious refrigerator. When we clean our fridge, we take out everything first then we defrost the freezer. We wait until the ice melts. 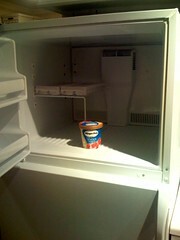 We never forget to put the items we remove from the freezer in a container with ice so as to avoid spoiling them. Then we clean the freezer by removing the melted ice with a dry cloth to absorb the wetness. Next, we clean the body itself. We don’t use a special cleaning material for the fridge. Soap and water will do the job. We just make it a point that every single part of the fridge is cleaned well. After cleaning the fridge, we put the items we removed one by one but we made sure they are also cleaned e.g. outside surface of food containers. Then we put charcoals inside to remove unwanted odors and to maintain a good smelling refrigerator.